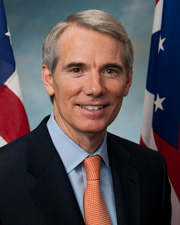 A Senator and a Representative from Ohio; born in Cincinnati, Hamilton County, Ohio, December 19, 1955; graduated from the Cincinnati Country Day School, Cincinnati, Ohio; graduated Dartmouth College, Hanover, N.H., B.A., 1979; graduated University of Michigan School of Law, Ann Arbor, Mich., J.D., 1984; associate counsel to President George H. W. Bush 1989; deputy assistant and director, Office of Legislative Affairs, White House Office 1989-1991; elected as a Republican to the One Hundred Third Congress, by special election, to fill the vacancy caused by the resignation of United States Representative Willis D. Gradison, Jr.; reelected to the six succeeding Congresses until his resignation on April 29, 2005 (May 4, 1993-April 29, 2005); U.S. Trade Representative, in the cabinet of President of George W. Bush 2005-2006; Director, Office of Management and Budget, in the cabinet of President George W. Bush 2006-2007; elected as a Republican to the United States Senate in 2010 for the term ending January 3, 2017. Michael Dewine He is currently (June 3, 2011) the Attorney General of Ohio. Former US Representative and Senator from Ohio. See Toledo Blade, Republicans for Lawsuits, June 2, 2011.